SLAP Tear - Definition, Anatomy & Causes - Jeffrey H. Berg, M.D. I have previously discussed labral tears of the shoulder. 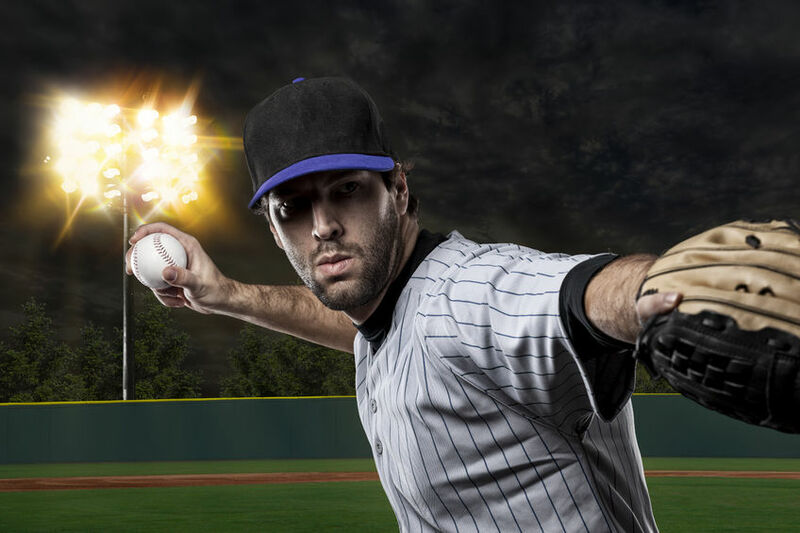 A SLAP tear is a particular type of labral tear. SLAP stands for “Superior Labrum from Anterior to Posterior”. When the superior (top) part of the labrum is torn within its substance or from its attachment at the top of the shoulder socket, a SLAP tear exists. This tear may extend from the front (anterior) to the back (posterior) part of the labrum. It may also be more localized. As you may recall, the labrum is a cartilage ring that surrounds the socket (Glenoid). The labrum at the bottom of the Glenoid serves as an attachment point for ligaments that connect the upper arm (Humerus) to the socket. It also deepens the socket. Both of these functions help stabilize the shoulder. 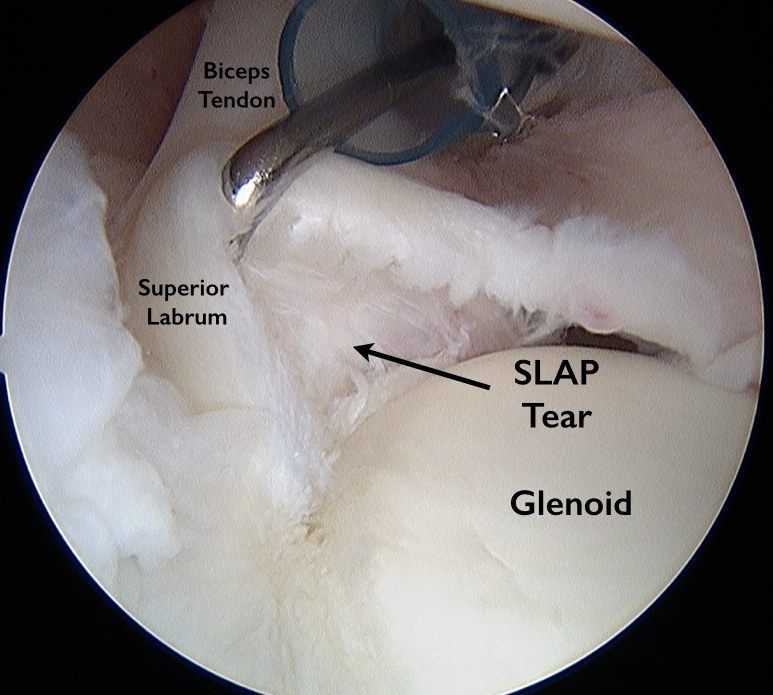 The labrum at the top of the Glenoid, the superior labrum, is the attachment point for one arm of your bicep’s tendon. It also maintains continuity for the remaining labrum and therefore assists indirectly in stabilizing your shoulder. Just as there is tremendous variability among the way people look, there is tremendous variability in the way their healthy superior labrum may appear. Sometimes this region of the labrum is firmly fixed to the superior glenoid. Frequently it is not. Sometimes the labral tissue in this area of the shoulder is thick and sometimes it is rather thin. All of this variability can make differentiating between a person’s “normal” anatomy and a SLAP tear very difficult. Initially when SLAP tears were first described, surgery for this problem was common. It appears that this was due to over-diagnosis. That is, calling rare forms of normal anatomy of the superior labrum a tear. Fortunately, shoulder surgeons’ understanding of the variability of this region of the labrum has grown. As a result, we are now better at determining when a tear exists and when one doesn’t. As a result, the diagnosis of a SLAP tear has become much less common and with it, SLAP tear surgery, much less frequent. A SLAP tear may occur from an acute traumatic event or from recurrent micro-trauma. The tears caused by acute trauma occur when the arm is forcibly stretched overhead. They may also occur when the arm is pulled forward, away from the body, as may occur while holding a steering wheel of an auto that abruptly stops during an accident. In both of these cases, the bicep’s tendon attached to the superior labrum, essentially “pulls” the labrum off the top of the Glenoid. A somewhat similar mechanism also causes SLAP tears that result from recurrent micro-trauma. These tears most commonly occur from repetitive overhead sports such as during baseball pitching, playing volleyball or tennis or while rock climbing. During these activities, the bicep’s tendon also pulls on the superior labrum. However, it does so with less force though the mechanism occurs repeatedly. This is the so-called “peel-back” mechanism you may read about. Much like the effect of bending a paper-clip back and forth until it eventually breaks, the labrum’s attachment is slowly disrupted until a SLAP tear ultimately results. SLAP tears are a rare source of shoulder pain. They can occur from an acute injury or recurrent micro-trauma. How they are diagnosed and treated will be discussed in future posts. In the meantime, if you believe that you may have a SLAP tear, I advise you to seek the opinion of a shoulder specialist.